What caused me to blow off the dust? - I'd consider myself to be a pretty big Cult fan. The collection has Southern Death Cult, Death Cult, Astbury solo records, imports etc. There are records that I always go to with them. Their "Love" album might be a top 5 album of all time for me. This record I am not sure I've listened to in full since the first few days it came out. This is/was just one record I never think to check out. Overview - Formed in 1983 the two core members of Ian and Billy have seen their fair share of ups and downs. 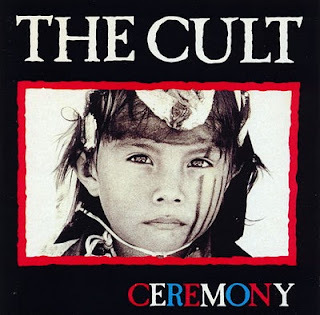 Going from underground icons to what many categorized as a heavy metal alternative band the Cult have been keeping fans happy for the duration. As "The Cult" this would be the bands fifth full length studio album. They were coming off the heels of two of their larger/popular records (Electric and Sonic Temple) and the fans and critics were ready for something to really keep the momentum going. The albums timing was poor as grunge music was beginning a strong foothold and Astbury and Duffy were having issues as well. The album would also suffer some controversy as the photo on the album cover was not properly credited or the person compensated. The band would release another record after this, but take a break for a few years to refresh and get inspired once more. FDF Comments (aka the songs) - A quiet, swirling guitar and some tambourine shake open "Ceremony" before the big guitar chords from Duffy come over the top. The drums clash around the cymbals and the song takes a good minute before the entire band comes in. Astbury sings the title with his god like vocals. I've always been a fan of his vocals, granted over the last few years he has lost some, but a little studio tweaking does the trick. The drums hit hard (provided by Mickey Curry on the record), he hits them and Duffy blasts the quick run of solos whenever space allows. The interesting part is there is a long guitar solo over the last run of the chorus, but Duffy had sort of been doing this all along you suddenly realize "he's been soloing for a bit". A pretty strong album opener. A track the band will perform live to this day is "Wild Hearted Son". It opens with some Native American song/dance before the guitar begins. Astbury is right with Duffy at the outset and he opens up vocally very strong. We get the big wall of guitar riffs before the full band locks into the driving 4/4 beat. It is a pretty straight forward rock song, would have fit nicely on the "Sonic Temple" album as well as it has the feel of their hit "Firewoman". We keep the driving rock tempo on "Earth Mofo" which showcase once more the hard hitting drum work of Curry. The bass is pushed up in the mix as well and rumbles along with the drum. Duffy seems to be locked in to a 3-4 chord phrase here and he is just gunning in. The song is about as fast a song as you'd ever hear from the band and it has some rock solid bottom too it as well. Acoustic guitars are brought out for "White" and the band brings the tempo down, seemingly, until the 45 second mark before they bring it back in full. It is not a power ballad, but its not a heavy rocker for the duration either. This is one of the first songs on the record that got me thinking it is just "too long". Not sure why I feel that way since Duffy has a great solo for the final few minutes and the band seems to be clicking well, it just seems "overdone" for some reason. We hear piano at the start of "If" and it remains just the piano and Astbury and remains as such until we get the full band treatment once more. Once again, Duffy gets the tail end of song solo, that is strong but falls victim to being faded out. Wonder where this could have gone. With a song title "Full Tilt" you get a single guitar on the intro before it is over dubbed and the drums come in. It is a driving song, but not as "full tilt" as the song title would suggest. It fits well on the record, but is no "quicker" than others. The band experiments with some odd time signatures, and instrumental break downs. The band really seems to go full tilt at the end, and it feels a long time coming. "Heart of Soul" is another song that uses the acoustic guitar at the intro with then an electric guitar to accent it. It has the same feel as the prior track "White" with the big drums coming in and a rock ballad but not rock ballad feel. Astbury is in fine voice and seems to feed off the guitar work, billowing as much and as often as he can. The band mixes good tempos on this and allows the band to shine and then even allow the quiet parts to speak loudly as well. "Bangkok Rain" returns to the big wall of sound from earlier picks on the record. It sounds like a Cult song if you catch my drift. A cello and acoustic guitar are the instruments of focus as "Indian" begins. The same run of guitar and cello loops for the first 45 seconds of the song before Astbury comes in. As the chorus comes in Astbury really pushes himself vocally. The song is not overly interesting but shows the band can change direction and adapt to that change well. "Sweet Salvation" also opens with acoustic guitar and is a more "full band" version of the prior song. It could easily fall in to the power ballad genre. There are big soaring female vocals assisting in the chorus. The record closes with "Wonderland". Astbury begins the track with more of a spoken word feel to his vocal delivery. The buzzy guitar starts up and the drum tempo falls to a simple 4/4 time. Duffy continues to flash the big guitar riffs, and tosses in solos whenever he can. This happens a few times, but it is always welcome. A strong album closer. Where are they now? - Ian and Billy are still perform live together. Astbury has been quoted as saying the band didn't have any plans to hit the studio since the music business has changed and there is less focus on albums as a whole. The two took to the road in 2009 to perform the Love album in full and then mix in some big hits. Hopefully the band finds the outlet to get new music out. FDF Personal Comments (aka the Live experience) - Four times I have been able to see the Cult. The first time was July 25, 1989 at the Centrum in Worcester, MA opening for Metallica. You read that right, Metallica. The opening slot was a thrill, we got down to the floor off to one side and caught the last 2-3 songs from there, but left the venue before Metallica even hit the stage. Looking back of course I wish we stayed, but I didn't drive. The second time was 10 years later on August 2, 1999 at Avalon in Boston. The band had broken up, taken a break, reformed..you name it so it was great to see them again. November 9, 2006 a good buddy got us VIP treatment at the Hampton Beach Casino and Ballroom in Hampton New Hampshire. You can read the review I did here. The last time was September 12, 2009 at the House of Blues in Boston. The band did "Love" in full and I had a great time with some like minded long time friends and fans. Again, if you are in to such things here is the review I did for that one. FDF Overall Take - As indicated I've been a fan of their work for a long long time. Sure, they've missed at times but there is no reason to not have a least one Cult record in your collection, even the best of collections will have you wondering what else the band has done. If you want to buy the record, here is a good spot. Regarding the Mp3's, I am still a little nervous to post them here (its only been three weeks since they have been tearing mp3 blogs down). Anyway, if you want to check something out, shoot an email to laokas2002 at yahoo dot com and I'll fire 1-2 mp3s from this record your way (or give you a link). What caused me to blow off the dust? - I have to admit this was not my first pick the bands records to go back to listen to in full. I had in mind another record of theirs, but I can't seem to find it at the moment. So, in keeping with the same band I decided to go with this. It has been ages since this got the old "front to back". Overview - The band formed in 1985 after the prior band that brothers Chris and Peter Coyne had disbanded. Considered a little ahead of their time the band blended a slight bit of pop music with a heavier alternative/college radio vibe. The band would go on to release a few studio records and tour extensively, creating a reputation as one of the finer live bands on the circuit. The Hull, England based band would dissolve in 1994, but reform 10 years later. 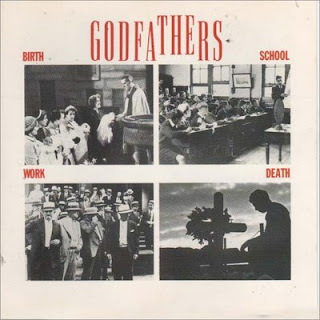 FDF Comments (aka the songs) - The album opener is the title track and "Birth, School, Work, Death" wastes little time hooking you in with the pounding drums and swooping bass line. The guitars cut over the verses with long chords while a second does a short run. Peter Coyne has a great enunciation to his voice and he pushes the urgency of the track. It is a great opening track for a bands major label debut. "If I Only Had the Time" continues the album at a steady clip and on this the backing vocals are more "harmonic" than chanting of the prior tune. The bass and drums are prevalent in the mix which is nice. Percussive instruments also stand out at various points. A good, quick guitar solo brings it all back around to the verses. The opening of "Tell me Why" feels odd, slower and less aggressive, but that doesn't last long. Before you know it the guitars are pushing and following the torrid back beat of drums. At the chorus the the backing vocals are almost playful with the aggressive clip of the song. The drums really hit hard and are the focus of the track musically since the guitars seem to fill a secondary role. "It's So Hard" has a more "Celtic" feel to it at the outset. The laid back track (hardly mellow for this record thus far). Peter seems to be in his element, not pushing so hard he sounds really strong and well balanced. The band is not on its torrid pace, but still the drums have a steady whack to them. The buzzy bass opens up "When I Am Coming Down" and the ride cymbal gets a long roll before the guitars come in and play off one another. For the first time on the record the band seems to tinker with vocal effects and longer delay/flange effects on the guitar. The result is a swirl of vocals and guitar around your head when you listen via headphones, you almost become disoriented for a moment. There is also a spoken word section over the music later in the track before it all comes back. The crazy effects return later in the track, and its even more aggressive, but it adds a very cool fresh sound to the tune. A lone guitar starts off "Cause I Said So" and it is slow to build as s second guitar gets more frantic building up with the bass and drums. By the time the vocals come in we are locked in to a 4/4 rocker of a number. The backing vocals on the chorus are practically shouted to match the lead vocal portion. "The Strangest Boy" has a unique intro with a slow build and almost like a didgeridoo but not quite. I am not sure what it is, or how they did it, but it swirls up and the song takes off. The track falls in to a steady groove and the vocal harmonies at the chorus are falsetto in their delivery but they get macho with chants of "Hey!" from time to time. The band uses the delay/phase again as the track fades out. I wonder if they had to meet a quota on the gear to do this. Its neat, but seems overdone at the same time. "S.T.B" is a straight to form rock tune. Driving bass and drums with the guitars dropping their choppy buzz over with short riffs to keep the song on a steady clip. " Just Like You" seems to follow suit of the prior track but really only from a musical stand point. Lyrically it has more of a light feel to it, with the band not as "boisterous" as some of the other tracks. Again, its nice to see the band spread its wings some and take a chance. "Obsession" has an odd intro with some screaming and moaning (non sexual) before the machine gun rap of the drums begins. Mazur holds the beat firm as the guitars fill in some voids, but until the chorus' the band doesn't get too wild. They all seem to find their place and stick with it, but the drums get a steady workout. The album wraps up with "Love Is Dead" a quick song that sorta goes out with a dud. Its not that it is a bad tune, it just doesn't leave you wanting "one more song". Where are they now? - Disbanded in 1994 the band would re-form in 2004 and remain active. According to the bands official site they reunited the original line up to reissue an expanded version of their debut album "Hit by Hit" in 2008. Checking the bands web site they are currently active as a touring outfit. FDF Overall Take - The lead off single aside if you asked me to name me another song from this record I probably couldn't have done so, and even two weeks from now I am not sure I could. The one part I did take from this is I can see how the band is regarded a strong live band. All the tracks on this disc have a great live vibe to them. I can imagine a frantic audience happily bouncing along and waving fists in the air, just not sure they'd know the lyrics. It is not a slag to the band at all, as the tunes do pack a wallop but perhaps they were just ahead of the curve years ago and sort of suffer that fate...for better or worse. They have piqued my interest in not only finding my missing cd, but checking out some of their other albums. The band has an official site here as well as a myspace pagehere. Thanks for reading, hoping to post mp3 samples again soon. What caused me to blow off the dust? - The first few records from this band are really great. I mean REALLY great but they never seem to get much attention barring the bigger radio singles. I found the last few studio records to be sort of dull as well, but in going back to this (and other records) I think I need to track down the last 1-2 that I have bailed on and listen for gems there. 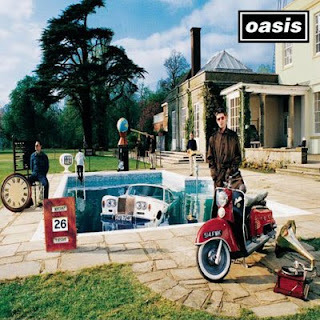 Overview - This is the 3rd full length album from Manchester England's Oasis. Formed in 1991 by two brothers, the band would become critical darlings with the audience to follow. The band has a rabid fan base that has slowly rolled to American shores. The band would headline stadiums overseas, but in the States they'd sell smaller theaters on their early tours. With a retro sound, a major love of the Beatles, the battling brothers would often get in to fist fights before, during or after shows. The band would battle its demons with drugs and alcohol, but the first few records would each seem to only catapult the band to bigger and more ravenous fans. FDF Comments (aka the songs) - There is a long slow fade (actually buzzing airplanes) that begin "D'You Know What I Mean?". A track (one of three that clock over 7 minutes on the record). It takes a bit to build with guitars and drums breaking down, then picking up. Liam comes in with the trademark swagger vocals and the band is locked in. The chorus has a great deep hook on it and Noel harmonizes over the top of Liam and the band keeps its focus before the first burst of a guitar solo takes place. There are a few more solos that occur, but Noel keeps them standard and within the limits of the track. The track fades with what sounds like a reverse loop on the guitar "My Big Mouth" is next and opens up far more chaotic. The big wall of guitars and drums before locking in to a groove. Liam shakes the tambourine on this one like a manic. People perhaps don't see the band as a "rock" band, but this proves anyone wrong. Noel once again shows his chops on the solo but on this track you start to really hear all the other rolls being filled. Its big, bombastic, loud and at times scary good. It mellows out more on . "Magic Pie" a track that is layered with acoustic guitars. Noel starts off the lead vocals on this with a compression on his voice and keyboard fill over, before the band comes in and it gets a little more rowdy. The end is very odd with some sort of samba record being played. A live staple is next in "Stand by Me". It is not a cover of the classic Ben E. King, but an original piece. Liam is back at the helm for the lead vocals and the band has a pretty laid back approach, but as the chorus grows near the band gets more urgent and there are some string section fills as well. A true diamond in the rough (for me personally) is "I Hope, I Think, I Know". This is one track I'd play for someone that says they don't like Oasis, or their "hits". It just rips vocally, instruments wail and get Champagne Supernova so far out of your head. Leading to the chorus the band really gets going and Liam really pushes himself with excellent result. "The Girl in the Dirty Shirt" returns to a little less rowdy version of the band, but none the less "full". One thing I've noticed this far into the record is Oasis has a big/full sound and are proud to show it off. In reading about this record I was surprised to read that Johnny Depp (yes that Johnny Depp) plays slide guitar on "Fade In-Out". The song takes a bit to get rolling (about 3:08 in) and has the first real "beatles" reference when they utter the words Helter Skelter. The slide solo is pretty darn good actually, and I had NO idea. Well done. "Don't Go Away" is a more acoustic lead number again. It sort of calms the listener once again. There appears to be another string section and there is an extended acoustic guitar fade out. The title track comes next in "Be Here Now". The heavier guitar returns and the band falls in to unison quickly on this straight up rocking tune. The longest track on the disc is "All Around the World" at over 9 minutes long. The band goes for a laid back intro but the song has a poppy feel to it, even if the vocals are laid back. The song continues to grow to be a big huge sing along of feel goodness! We get horns, guitars and it just grows and grows. It would be a perfect album closer, but the band has other ideas. (we actually get a 2 minute reprise as the album closer). Before that reprise is "It's Gettin' Better (Man!!)" another track that opens with big guitars and it is off to the races. The lyrics are quick, the guitars are big, the bass and drums rumble. A very strong track. Where are they now? - In recent months nobody can really tell. It looks like the long standing brotherly feud has caught up with Noel and Liam. Rumors of a band fight and breaking of a guitar in the later parts of 2009 caused Noel to announce he was leaving the band. Liam has gone on to say it is not Oasis without his brother. As far as the band being together its all rumors at the moment. In those rumors Liam is reported to have a new band with material ready to be released in the summer of 2010. Noel, who I feel is far more prolific, will surely have something coming. FDF Personal Comments (aka the Live experience) - In looking I have only seen the band two times (I swear it was 3). Anyway the first was April 27, 2000 at the Orpheum. They were pretty darn tight and this was their first run of "larger venues" in the US. The second time was an opening slot for the Black Crowes??! That was June 11, 2001 at the much larger (what is now) Comcast Center. Oasis is pretty straight forward live, but they sound really good, and are way louder than you'd expect. FDF Overall Take - The band was really at their height when this came out and some reviewers called in bloated and self indulgent. A lot of people don't care for Oasis for one reason or another (probably the bloated arrogance of the band members) but all that aside, this band knows how to write some pretty awesome tunes. If you are uncertain, check out the double live cd called "Live at Wembly". If that cd doesn't sell you, nothing will. Some great information on the record can be found in this Wiki article. In lieu of me posting mp3's check out the Last FM page for this record. Not only posts, but entire blogs. You can imagine the frustration of writing something, posting it, then all of a sudden it is gone like it was never there. You can read a little about the story here. Many of the blogs were/are far bigger than this one. What does this really mean? Well for now, I will post links to "legal" streams if you will. Lala, myspace, Last FM. The music on my site was only to ever give you an idea of what a band is like. Since discs were "forgotten" chances are you owned, heard, still play the cd anyway. It was just something more to do and add to the sites appeal. I could create my own real "www" site but I am about as tech savvy as nothing. I appreciate your patience, and any and all feedback is welcome. The comment fields are far too lonely around here for the # of downloads that were coming off the site. Should be a new post this week, just a smidge different. At least for now. What caused me to blow off the dust? 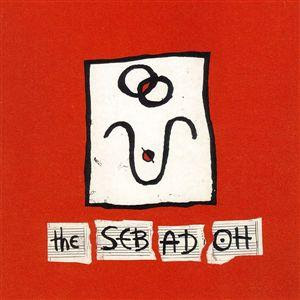 - This being the lone Sebadoh cd I owned it was not that hard to blow the dust off it. I bought it used for one particular song, and am not sure I ever even gave it much attention as a whole collection. Overview - The band formed in 1986 in the western part of Massachusetts state. Lou Barlow was the bass player in the band Dinosaur Jr. and was let go, but had logged some playing and recording time with Eric Gaffney. The two would form Sebadoh. The band would have a release out each year from 1989 through 1994 and then they'd release two more, including this record, their final. This is their last cd and the only one with drummer Ross Pollard. FDF Comments (aka the songs) "It's All You" opens with some sort of buzzy lo-fi bass or guitar before the band picks it up. It has a a fun bouncy feel to it, something you'd' never really expect. The guitar punches through the simple back beat of drums, and the band explodes on the chorus together. "Weird" opens right up with the punchy guitar and the bass is a lot more present on this track. The band chugs right along and then has a cool instrumental and vocal break down to accent the tune nicely. What the band does sounds a lot like what was popular for the indie pop alternative at the time. Think Matthew Sweet but a little dirtier to give you an idea. The band keeps it short and simple on "Bird in the Hand" a quick and rowdy tune with scratchy vocals and the big downbeats to fill the voids. The drum sticks click off "Break Free" and the drums get a work out with a focus on the tom toms. The drums don't seem to match the laid back feel of the song. The band is not in a rush at all on this and explore the vocals more on this track. Acoustic guitars ring out for "Tree". A pretty song, with the focus on the guitar and vocal for a verse before the band comes in to fill out the sound. The acoustic is pushed up in the mix and the song really embraces that feel. It is nice to hear the band sort of break out of the mold and stretch out. We return to a little more of the rocking side on "Nick of Time". The bass drums and guitar all seem to be working off an odd time signature giving another unique feel to the track. The song that got me to buy the record is "Flame". The drums slap out a marching tempo and the guitar buzzes below it but it has this infectious hook, and the drone of the lead vocals drag you right in. The cool part is it does it all over again, so you get a great run through again. Its not overly complex, but some neat phasing on the guitar and vocals make it even trippier. Such a great track, and the false ending is a great touch. "So Long" is a darker quick run of a track that is short and to the point. The band seems to go long, short long and we get on the longer side again with "Love Is Stronger" at close to 5 minutes. The vocals start of this and waiver some, before the single guitar slowly builds it up. For the first time we get a track with a longer guitar solo, but not a flashy solo just as a driving force on the tune. The bass compliments the solo very nicely and the band falls back in to a tight sound for the verses. For all their hard work we get another very rocking tune in "Decide" and it fits well. The record is mixed very well bridging the gap and really giving the listening full range of what the band is capable of. The percussion instruments get a strong work out on this track as well. The guitar and drums play off one another on the intro to "Colorblind". The music has a big sound to it, but the vocals are a little more laid back. The vocal delivery is upbeat and they push themselves for urgency, and, the vocals have a peppy bounce to them. "Thrive" gives slow choppy guitar notes mixed with a longer held chord before the band gets moving. Once again the band is comfortable with each players role and not one instrument is the focus. This cohesiveness is refreshing in that the band is a whole, not single members. The track "Cuban" has an aggressive sounding guitar that can't seem to get in tune. It bursts single notes accented with cymbal crashes before the band all clicks it together. The track is odd in that it feels a little incomplete, sorta like a jam session caught on tape but that could be the charm. The song "structure" returns on "Sorry" and the song feel similar to others on the disc. Not really breaking new ground, but not a bad track either. The record concludes with "Drag Down" another quick rocking tune with focus buzzy guitar on the back side of the verses. The band has a lot of fun on this track and it is a strong album closer. Where are they now? Barlow worked with Folk Implosion, then "the new folk implosion" and he played some with Dino Jnr again. Jason Loewenstein is busy with The Fiery Furnaces. Sebadoh has also reformed (never really breaking up) as recent as 2008 performed live together. FDF Personal Comments (aka the Live experience) - I have never seen the band live. FDF Overall Take - Listening to the record all the way through I can see the bands charm, and this place in music in the late 1990's. What I like on this particular record I *really* like while other stuff is sorta uninteresting to me. As noted, this is the only cd I own by them, so perhaps there are other albums that better represent what the band is about? I'd be curious to hear your thoughts. The band on myspace. Lou Barlow's official page is here, and this page/ is Jake's official page. Also, the band's label, Subpop, has information here. Tracks were taken from "The Sebadoh" that you can buy here.